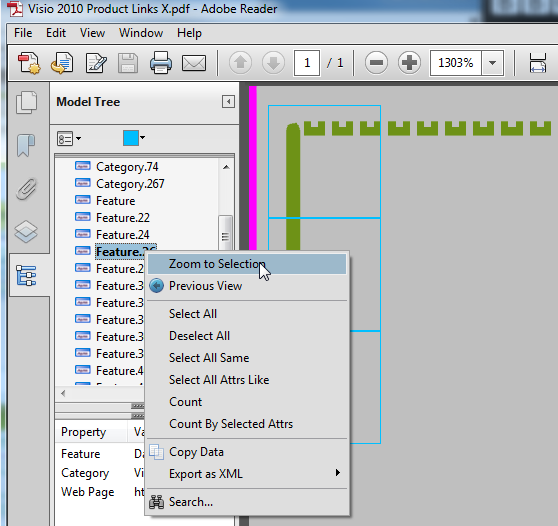 Does Adobe Acrobat make better PDF files from Visio? 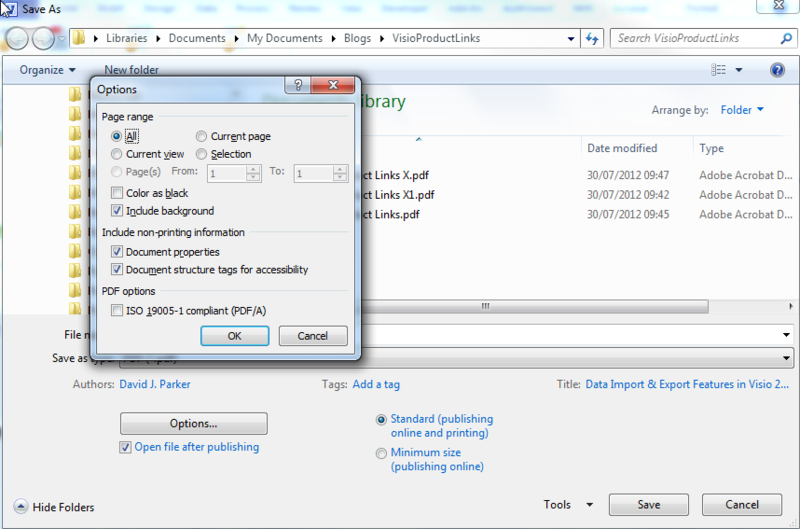 An export to PDF utility was freely available for Visio 2007, and was built in to Visio 2010. However, I have always been disappointed by the lack of support for Visio layers, Shape Data and multiple hyperlinks per shape in the PDF output. Microsoft have always told me that this is because they have limited control over the public PDF format, as opposed to the proprietary Adobe PDF format (These features are also surprisingly missing from the export to XPS tool, even though this format originated from Microsoft). 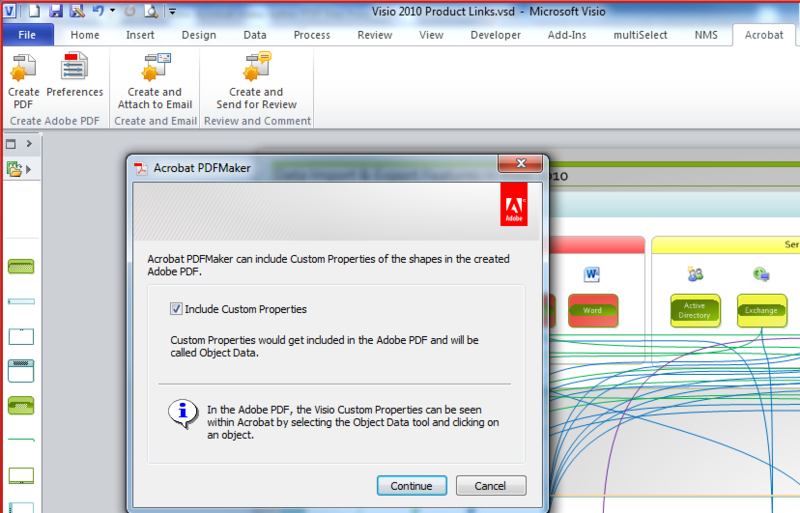 So, the question is, does Adobe Acrobat make better PDF files from Visio than Microsoft’s free tool? I downloaded the trial version of Adobe Acrobat X Pro after reading the product comparison at http://www.adobe.com/products/acrobatpro/buying-guide.html, because Acrobat X Standard does not have support for Visio. 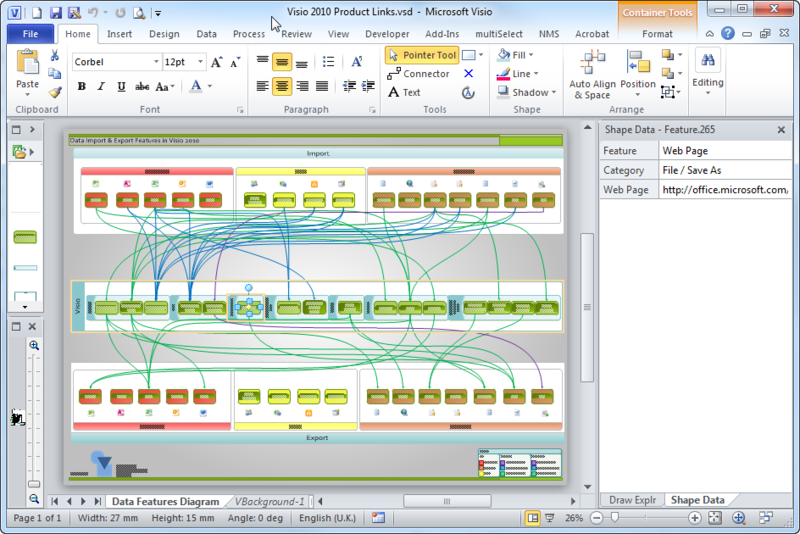 I used my diagram of Visio 2010 Import & Export Features (see https://blog.bvisual.net/2011/05/24/data-import-export-features-in-visio-2010/ ) for the test because it has multiple layers, Shape Data and multiple hyperlinks. 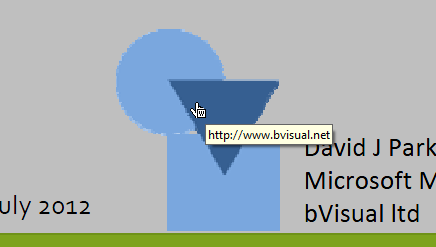 The bVisual logo in the bottom left corner has multiple hyperlinks, whilst all the other rectangles have singe hyperlinks…. When I viewed the output in a PDF reader, then I can see that there is support for a single hyperlink on each shape, but there is no support for multiple hyperlinks per shape, nor is there support for layers or Shape Data. 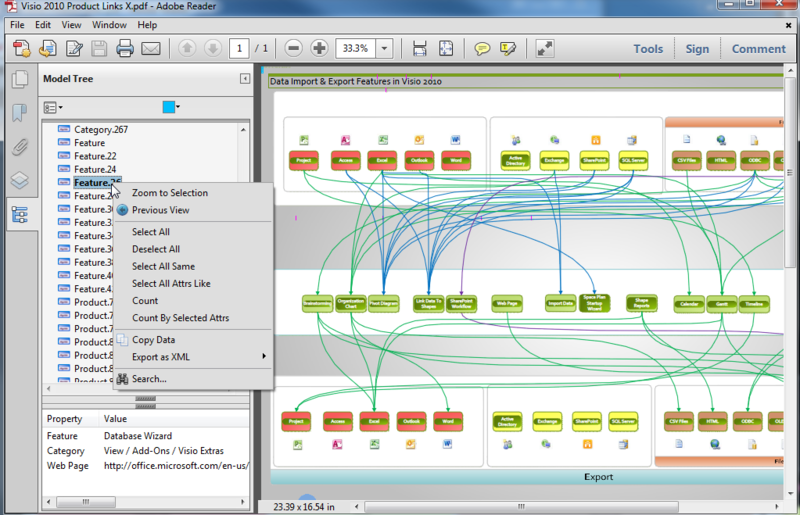 My previous experiences of Adobe Acrobat have been mixed: Whilst I have liked the support for layers and custom properties, I always used to find the way they loaded their add-in into Visio problematical. So, I have not loaded Adobe Acrobat for a few years, but I thought that I should check it out again. The conversion process was quite lengthy as it seemed to switch individual shape visibility off and on again. However, the promise of visual fidelity was not fulfilled … first thing I noticed that some of my container shapes were completely missing! Although my page layers appeared to be listed correctly on the left-hand side, only the Background layer toggled the layer visibility off/on – perhaps because the Background is actually a different page – not a real layer at all! Actually, even the Background was incorrect because it also changed the visibility of containers on the foreground page. So, perhaps the Shape Data is properly converted to Object Data? Well, it has encouraging to find the Object Data Tool displayed on the right mouse menu, however it didn’t seem to do anything for me. I started this blog article believing that Adobe Acrobat would provide better output than the Microsoft supplied Export to PDF inside Visio, but I was wrong. If you cannot trust a PDF writer to actually display all of the visual elements that you expect, then it does not matter what other bells and whistles it has to offer. 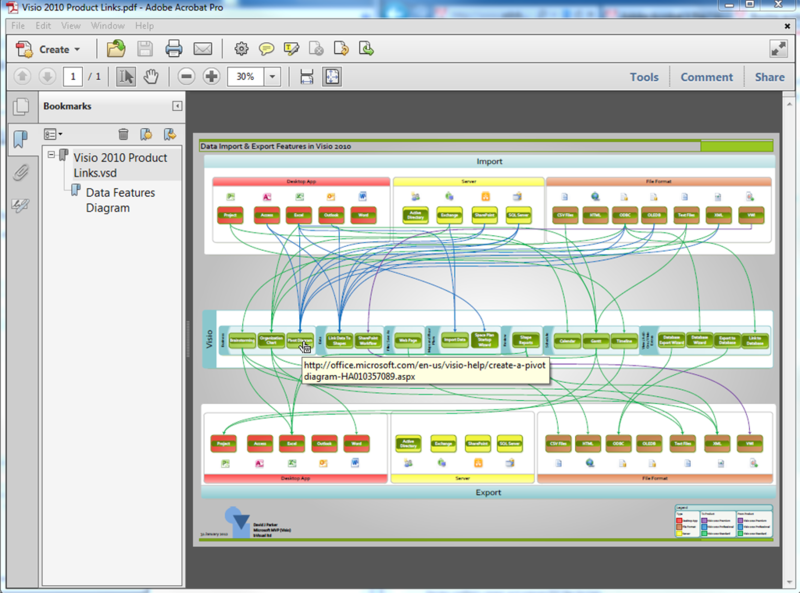 Adobe developers obviously do not understand the structure of a Visio document. Very disappointing! See http://en.wikipedia.org/wiki/Comparison_of_OpenXPS_and_PDF for a Comparison of OpenXPS and PDF. Back in Office 2007, Microsoft tried to release a PF maker based on Adobe’s free standard. Adobe complained and it was removed from the product and was made an add-in. After some negotiations, it was made part of Office 2010. So the product was a subset of the full Adobe standard. So it is understandable that you will get a better experience from the full version of Adobe. I tried this myself and it looks like it is the background layer which is blocking for the other layers to toggle off. 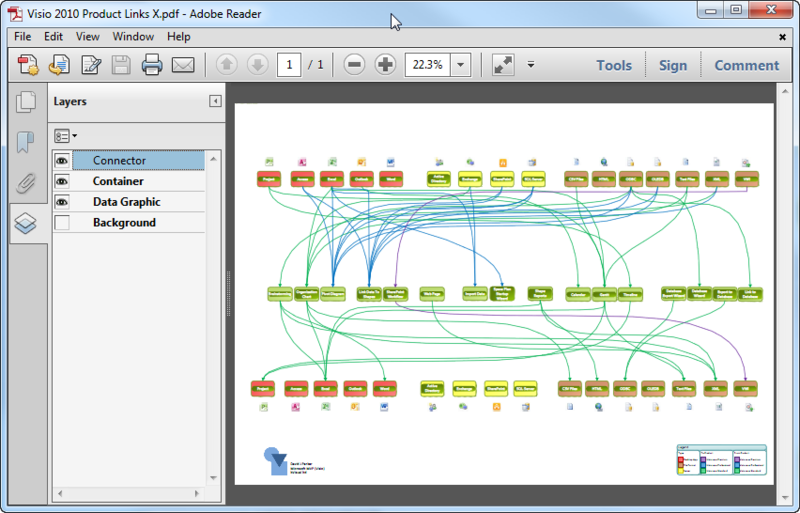 When I made a flowchart with no background color or elements that contained only boxes and connectors, and converted it via Acrobat to pdf, it worked perfectly! Any thoughts of how this can be fixed? 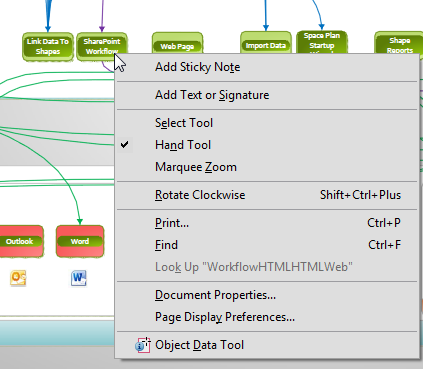 I really need some background elements in my flowchart to display it clearly. 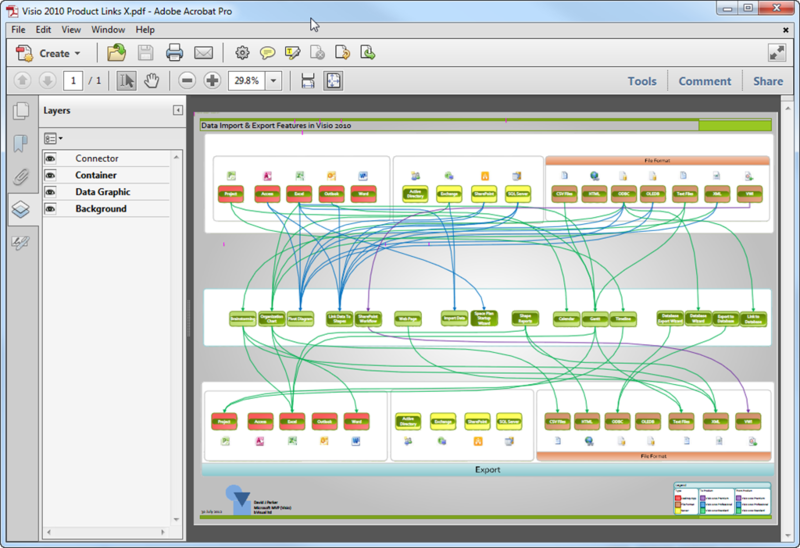 It may be of interest that we have a free Visio addin which will automate the application of data graphics to multiple page Visio diagrams and then saving copies of the diagram as PDFs. So if you have 5 data graphics available, it saves up to 6 different copies of the diagram (including the no data graphics applied variant). 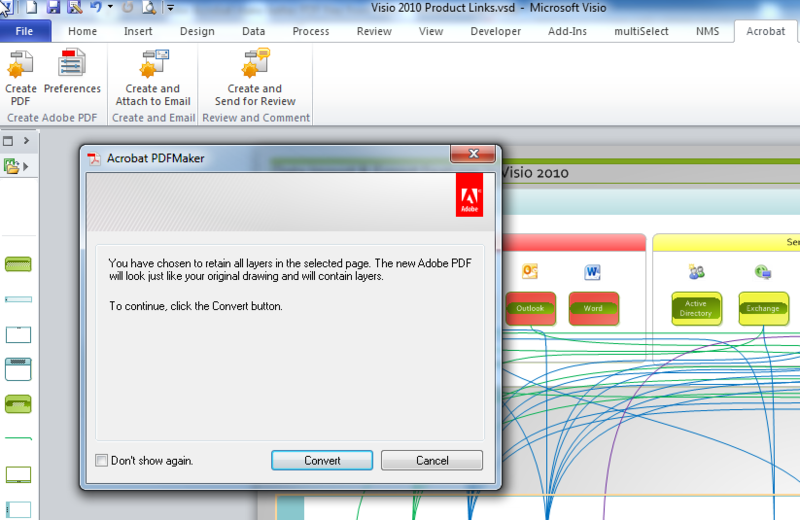 What I needed from the export capability of Visio 2013 to pdf was creating and preserving mailto-links, i.e. whenever someone clicks an item it opens the mailclient with the respective mail-address. 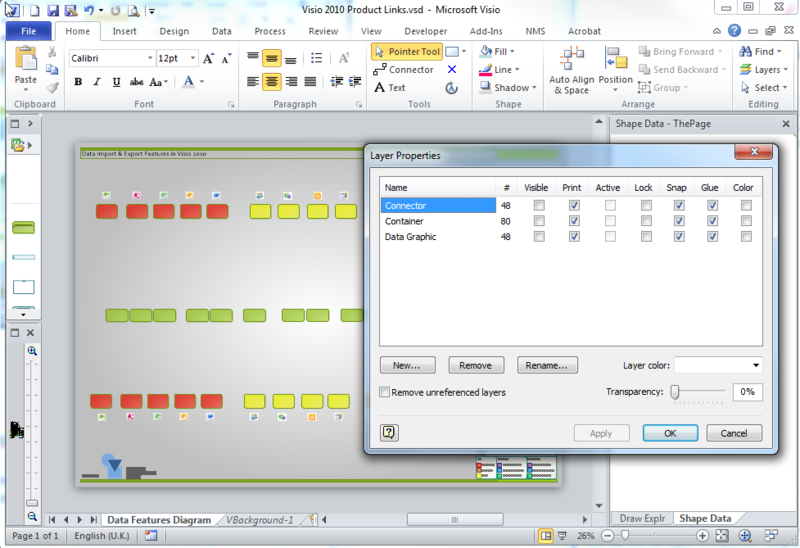 While marking an element in Visio 2013 and attibuting it with an Hyperlink (Ctrl+k) it worked with putting “mailto:” in front of the e-mail address. This is preserved in the pdf export. The same is true and works with regular links, e.g. 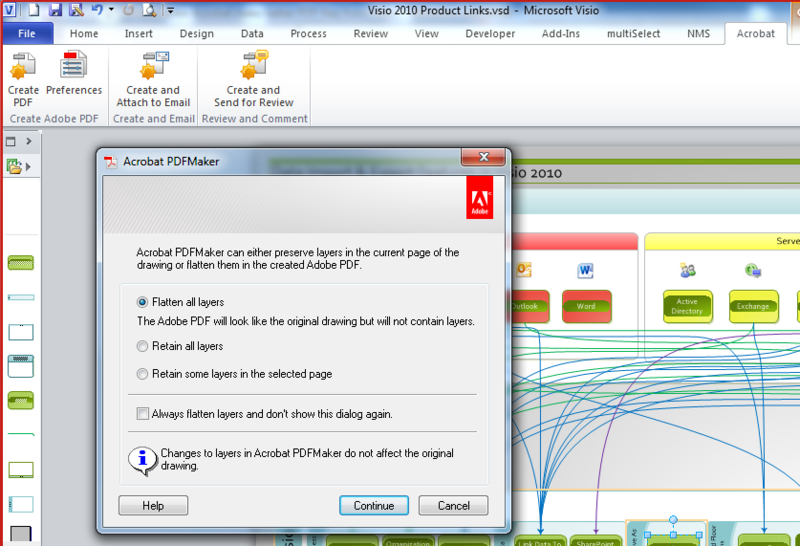 “https://blog.bvisual.net/2012/07/30/does-adobe-acrobat-make-better-pdf-files-from-visio/”. 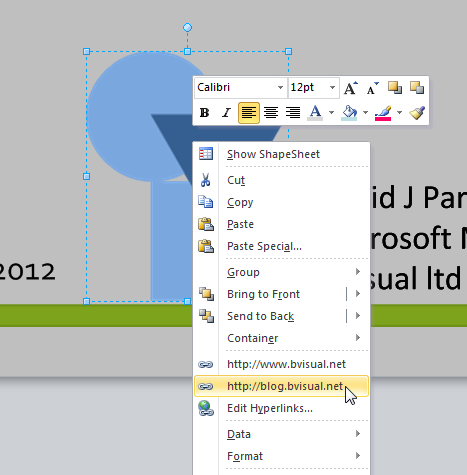 Visio shapes support multiple hyperlinks per shape … wouldn’t it be great if the pdf export did too?